10 and Under Tennis, was known as Quickstart, is an exciting play format for kids 10 years of age and younger learning to play tennis. 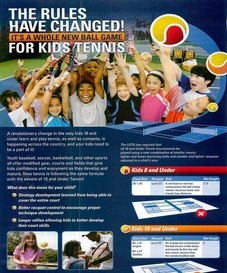 It is designed to bring them into tennis by slightly modifying the game for their age and size. All of the kids shown in the photos below were selected by the USTA to participate in the campaign and trained by Diana. Most of them are now on their school tennis teams and have a great tennis foundation.